Gina graduated with a Doctor of Philosophy (Arts) in Creative Writing from The University of Melbourne in 2016. Gina is a widely published freelance author and journalist whose writing has taken many forms - from essays, feature articles, and columns for magazines and newspapers (print and digital) to radio broadcasts for ABC Radio National, one of which - Behind the Shock Machine - won the Silver World Medal for history documentary in the 2009 New York Festivals radio awards. Gina combines freelance journalism with her current role as Communications Manager for Adult Learning Australia. Gina trained initially in Psychology but switched careers after completing a professional writing course. She has taught professional writing, as well as writing for digital media and journalism at Victoria University and The University of Melbourne. Gina is a published author of two creative non-fiction books, both of which were developed through her graduate research studies. Behind the Shock Machine: The Untold Story of the Notorious Milgram Experiments about Stanley Milgrim's obedience experiments came from her Master of Arts. The Lost Boys: Inside Muzafer Sherif's Robber Cave Experiment about group competition, cooperation and conflict came from her PhD. Both are critical, big picture interrogations of well-known social psychological experiments from the 1950s and 1960s. "I had a wealth of archival and interview material but I had to work out a way of telling the stories that would put these experiments into a broader context for the reader. I had to step outside the material to look at contextual influences as well as the role of the social scientists conducting this research. The books are about the experiments but they are equally about the men behind the research - their backgrounds and motivations as well as the political and social factors that shaped their research and enabled it to be funded." For Gina, her Master of Arts and Doctor of Philosophy (Arts) studies were instrumental in gaining this big picture perspective. "There was no emphasis in my psychology training on the history of the discipline let alone any acknowledgement that scientists were anything but neutral and objective. It was a pretty myopic view." Guided by "fantastic supervisors", her study of the history and philosophy of psychology equipped her to address these unexamined assumptions in a more critical way. "Doing the scholarly component of my dissertation really opened my eyes. And it had a big impact on my writing because I felt much more confident about what I was trying to say." Gina's books combine meticulous research with journalistic storytelling. While both books are written for the lay reader, her goal is also to have an impact in the academy. Her book on Stanley Milgram's experiments is increasingly referenced in psychology textbooks. 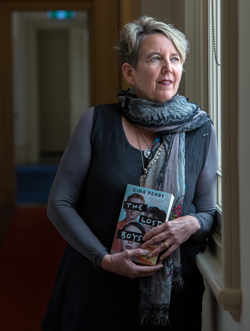 And with the release of The Lost Boys in the US in 2019, she hopes this book too will shape a more insightful narrative about iconic social psychology research of that era.